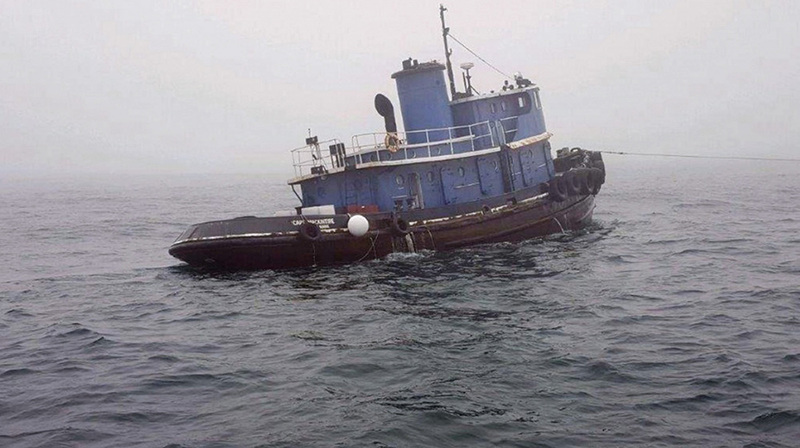 After colliding with another tug, the vessel sank Thursday in 158 feet of water about 3 miles south of Kennebunkport. A Coast Guard mission to inspect a tugboat that sank off the York County coast last week with barrels of fuel on board is scheduled to begin Tuesday morning. Coast Guard spokeswoman Chellsey Phillips said crews will do a camera survey of the vessel, which sank around 2 a.m. Thursday in 158 feet of water about 3 miles south of Kennebunkport. Phillips said underwater footage should give the Coast Guard a better idea of whether it makes sense to try to salvage the Capt. Mackintire. After the survey is completed, Phillips said a dive team will be sent into the ocean to evaluate the structural integrity of the sunken tug and assess potential pollution issues. The dive team may be deployed Tuesday, or possibly as late as Wednesday, she said. Frogmen Divers and Marine Services of Sandwich, Massachusetts, has been hired by an environmental cleanup company, Clean Harbors, to conduct the dive operation, Chief Petty Officer Kevin Hampton said. “Both companies will be on scene at first light (Tuesday),” Hampton added. In a statement Monday afternoon, the Coast Guard said it will establish a safety zone at the site of the dive operation and issue a special marine information broadcast warning mariners to avoid the operation. According to the Coast Guard, the Capt. Mackintire was being towed to Maryland by another tugboat, the Helen Louise, late Wednesday when the boats collided. No one was on board the Capt. Mackintire and two crewman on the Helen Louise were not injured. The Reef Shark, a Coast Guard cutter based in Boston, tried to tow the Mackintire back to Portland, but it started taking on water. The crew was forced to cut the towline, allowing the Mackintire to sink. The tugboat that sank was carrying eight 44-gallon plastic barrels of fuel on deck and had about 4,440 gallons of fuel in its tank. The two tugboats, which are owned by Tim Whitney of Annapolis, Maryland, were en route from Bar Harbor to Annapolis when they collided. Whitney buys boats and repairs them for use in movies and television. The Maine Department of Environmental Protection, the National Oceanic and Atmospheric Administration and the Coast Guard continue to do aerial and shoreline assessments of potential pollution, the Coast Guard said. The investigation into the cause of the sinking is continuing.